In 1816, Zalmon Wildman, a citizen of Connecticut, platted “Sandusky City” in Portland Township on the south shore of Sandusky Bay on the site formerly occupied by the Indian chief, Ogontz. The next year, Colonel James Kilbourne, the founder of Worthington, Ohio, visited New York City where he met Zalmon Wildman and Isaac Mills who had conflicting claims to land in Portland Township. Kilbourne effected a compromise between the two men with Wildman receiving three quarters and Mills one quarter of a larger town to be established on the site of what was to have been “Sandusky City” which Kilbourne suggested be named “City of Sandusky.” Kilbourne was to receive a one quarter share of the town and was the driving force in the city’s early development. The new town was surveyed and platted in 1818 by James Kilbourne’s son, Hector Kilbourne, a Freemason and the founder to the Masonic Lodge in Sandusky, who imposed the square and compass of the Masonic Emblem on the rectangular grid of the new town which continues to confuse travelers to this day. 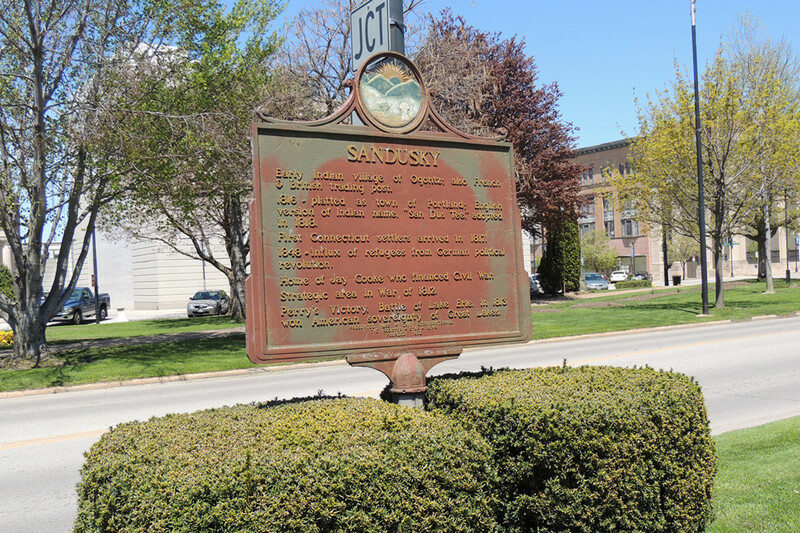 The City of Sandusky was often referred to as Portland, Ogontz Place or Sandusky City instead of the City of Sandusky which was a source of confusion during the city’s early years.